A bushfire on Christmas Day has destroyed more than 100 homes in Australia’s Victoria state, officials say. Ninety eight homes had been razed in Wye River and 18 at Separation Creek, officials say. No injuries are reported. Hundreds of firefighters have been battling the blaze along the famous Great Ocean Road in Victoria’s south-west, popular with holidaymakers. A change to cooler weather and rain has greatly reduced the threat, but some emergency warnings remain in place. 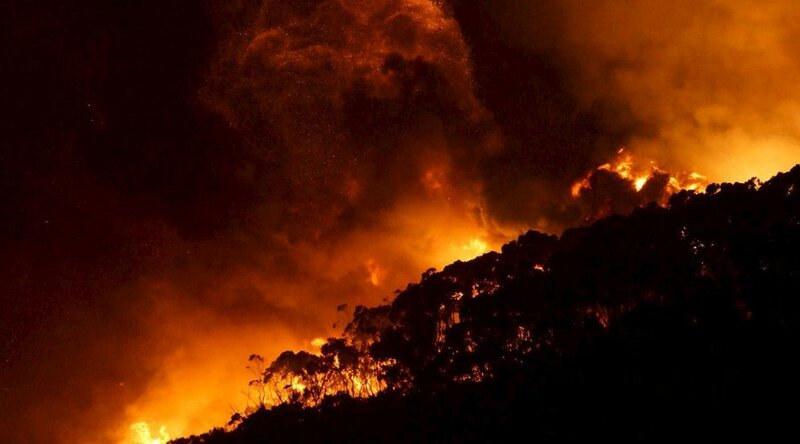 Some 1,600 residents and tourists from the popular tourist spot of Lorne were evacuated on December 25 amid fears that a wind change would push the fire towards the town, but were allowed to return on December 26. Many of those forced to leave their homes had to spend Christmas night in hastily-arranged shelters. More than 500 firefighters, 60 tankers and 18 aircraft have been involved in fighting the flames. Victoria Emergency Management Commissioner Craig Lapsley said they were “working around the clock to bring this fire under control”. Craig Lapsley warned that although the immediate threat had eased, the fire had the “potential to burn” for weeks to come. Thousands of tourists typically descend on the area in the days after Christmas to visit coastal towns. Many residents and holidaymakers were forced to flee, as festivities were abandoned when the scale of the threat became apparent. Anyone still planning to travel to the area is being asked to check emergency warnings and to avoid the Great Ocean Road if possible. The Falls Music and Arts Festival, which is held annually near Lorne, may not go ahead because of the fires, its organizers said. The fire began with a lightning strike on December 19 and has been fanned by strong winds and intense heat in recent days, burning across 5,437 acres so far. Victoria is one of the most fire-prone regions in the world. Many bushfires are started by lightning strikes, while others are sparked accidentally by campers or discarded cigarettes.